1977 – It was the look that got me. A kind of mutant Buddy Holly: knock-kneed, big horn rims, thrift store suit, turn-ups, Fender Jazzmaster. 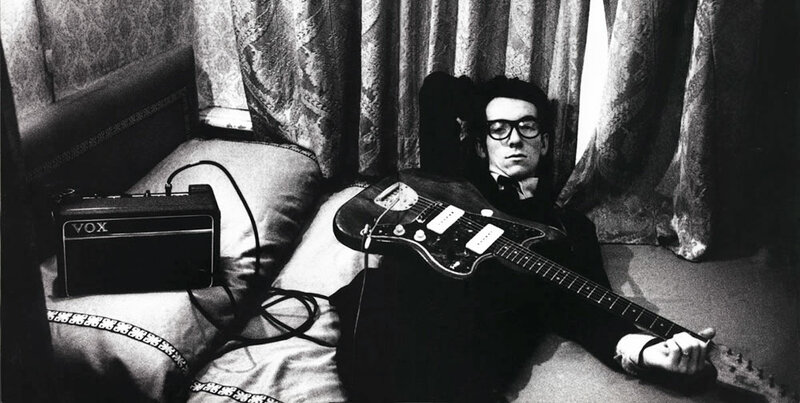 If a guy like this can be a star..
Declan Patrick MacManus pitched up at Stiff Records with a plastic carrier bag full of songs, a bristling punk attitude and the desire to tell the world all about it, joining a grab bag of artists punching well above their weight – Nick Lowe, Wreckless Eric, Motorhead, Richard Hell, The Damned et al. – and ultimately making the biggest impression on me. I’ve probably got more Elvis Costello records than any other artist, but none better than his first. Recorded in 24 hours at a cost of £2000 whilst Elvis extricated himself from his day job, My Aim Is True is thirty five minutes of frustrated ragged glory. Songs of love, loss and barely repressed anger, barbed insults and spiky puns. A hefty whack at the Fascist movement in Less Than Zero (subtly reworked for the US market by reference to Lee Harvey Oswald). The anti-love song Alison (does he want her back? does he want to kill her?). The smack in the mouth of Welcome To The Working Week – “Now that your picture’s in the paper being rhythmically admired..”. 82 seconds long and the best Album 1 Side 1 Track 1 of all time? Could be. Red Shoes and the snappiest line on the record – “I said I’m so happy I could die, she said ‘drop dead’ and left with another guy”. Bespectacled geeks rejoice, here is your champion! And there’s more.. It all burst out of Costello in a rush and a push: by the time of its release he’d moved things up a gear, his astringent lyrics married with increasing sophistication in arrangement and melody to produce the equally brilliant This Year’s Model only eight months later. He’d also acquired the Attractions – teenage keyboard prodigy Steve Nieve, inventive bassman (and future nemesis) Bruce Thomas and pub rock scene drummer Pete Thomas – and an aggressive demeanour, which led to some memorable moments on stage and off in subsequent years. If you don’t have My Aim Is True, don’t delay, buy today. Costello’s later recordings might have finer melodies and more sharply defined lyrics, but for intensity and passion, you can’t beat it. The US version also has the awesome Watching The Detectives – bonus. Recommendation: track down the live bootleg called Angry Young Sod to get the best impression of Elvis in concert back then, playing My Aim Is True, looking forward to This Year’s Model. The ear disapproves but tolerates certain musical pieces; transfer them into the domain of our nose, and we will be forced to flee.